A new month has passed and it's a theme day again... The whole CDP community will post chimneys today (that is if they anticipated for our portal is down again - in the mean time check our group on Facebook). I posted chimneys several times on this blog for the ones of Paris are really pretty typical. 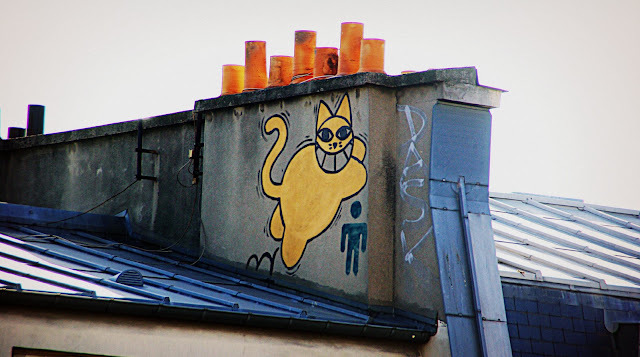 But this time I thought I would add a little bonus to it; a graffito by Monsieur Chat (Mister cat), whose real name is Thomas Vuille, a well known graffiti artist who paints cats everywhere, especially near chimneys! Have a nice Sunday everyone. Moi aussi. Chats et Paris? My two favorite things! Forgive me, Eric, for I have added you to my meme list. I read somewhere that it is better to ask for forgiveness than for permission! Would that be the same as a cat on a hot tin roof? Well done Monsieur Chat .... A cat on a chimney in Paris ... Beautiful! ooh, i think i saw the same in New York 2 weeks ago..! BTW, I have photos of Paris chimneys, but nothing local. An interesting proposal for the theme day. Well done, thanks for sharing and have a good week. I imagine it took some daring do to work on that roof. Beyond a grinning cat, it's amusing to see it jumping over a man represented by the universal symbol for the "Men's Room." Perhaps you'd like to link to this week's Monday Mural? I haven't seen Monsieur Chat before, I like him a lot.